Sonne´s Coffee Spot: New baby! Four years with my beloved ECM Giotto has come to an end. It has been a wonderful journey and the coffee has been great but when I recently had a good offer on the espresso machine of my dreams, I just could not pass. 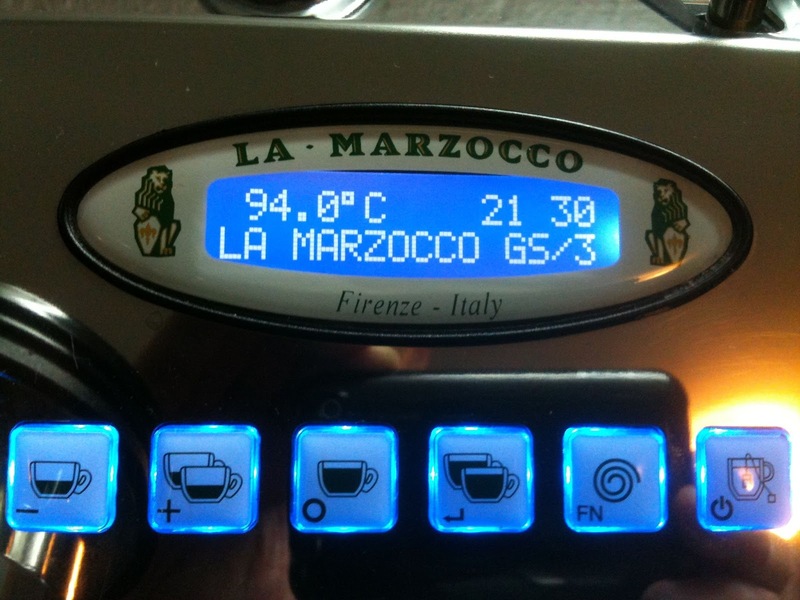 My kitchen counter now stars the much coveted La Marzocco GS/3. The machine is from 2008 (S/N 0315) and the former owner has not been using it a lot. In fact it's still using the original brew head rubber gasket which is still relatively fresh and soft. So does it brew better espresso than the Giotto? No Sir, it does not. Once you nail it with all the cooling flushing and the works, the Giotto makes excellent shots. The GS/3 just does it much more consistently. It's almost too easy ! Except for one thing; Steaming! The machine has massive steaming capability and you will not run out of steam but I must say I made better micro foam on my Giotto. The milk tastes great but it is near impossible to get bubble free micro foam and believe me, I have tried !! You need to purge quite some water from the wand and the steam is not completely dry. I should mention that my GS/3 is equipped with the no-burn steam wand as the early models and I believe all European GS/3's now ships with the "full-burn" steam wands largely due to the same issues I'm experiencing. I'm going to order the newer version steam wand to improve things on the steam side. As I was not sure about the exact history of the machine I went ahead and descaled both brew and steam boilers and luckily there were no scale what so ever. Opening the machine in order to descale the steam boiler also allowed me to take a closer look at the internals and I must say that the LM guys really shoe-horned a lot of high end espresso machine technology into a relatively small case. After descaling I removed the water reservoir which is located behind the drip tray and hooked the machine up to the mains water supply (via Brita softening filter) and installed the waste drain. Build quality is very good except for at couple of things. The drain box itself is good quality and with great capacity but it's loose at sits askew. Later models have tray locking taps under the drain box taking care of that problem. Also I have noticed that the drip tray top (rails) design does not drain too well and water will spill. The craftsmanship of the drip tray is not up to standards with cutting sharp edges and the before mentioned spilling. Again this has been changed on later models.